According to the website data.gov.in, Minimum Support Price is the price at which government purchases crops from the farmers, to safeguard the interests of the farmers. In the year 1966-67, the Government of India announced Minimum Support Prices for the first time for wheat, to save the farmers from diminishing profits. Since then, the MSP has been expanded to many crops. The Government of India announces the MSPs at the beginning of the sowing season for certain crops on the basis of the recommendations of the Commission for Agricultural Costs and Prices. 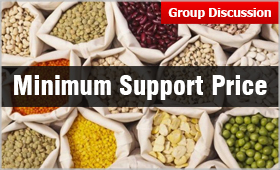 The Cabinet Committee on Economic Affairs (CCEA), Government of India, determines the Minimum Support Prices (MSP) of various agricultural commodities in India based on the recommendations of the Commission for Agricultural Cost and Prices. Currently the MSP covers 24 crops that include seven cereals (paddy, wheat, barley, jowar, bajra, maize and ragi); five pulses (gram, arhar/tur, moong, urad and lentil); eight oilseeds (groundnut, rapeseed/mustard, toria, soyabean, sunflower seed, sesamum, safflower seed and nigerseed); copra, raw cotton, raw jute and virginia flu cured (VFC) tobacco. The idea behind MSP is to give guaranteed prices and assured market to the farmers and save them from the price fluctuations. It shields farmers from the unwarranted fluctuation in prices caused by the variation in supply (largely influenced by the monsoon, drought), lack of market integration, information asymmetry and other elements of market imperfection afflicting the agricultural markets. The guaranteed price and assured market are expected to encourage higher investment and in adoption of modern technologies in agricultural activities. Further, with globalization resulting in freer trade in agricultural commodities, it is very important to protect farmers from the unwarranted fluctuation in prices, manipulated by the international level price variations. For the 2018-19 crop season, the Cabinet Committee on Economic Affairs recently announced an increase in minimum support prices to 50% above the cost of production. The Committee approved the MSP of 14 Kharif (summer grown) crops. The announced MSPs also include a ₹200 per quintal increase in the MSP for paddy, which is likely to inflate the food subsidy bill. In a press briefing Rajnath Singh, the Home Minister of India, said the hike would boost farmers’ income and purchasing capacity, and have a positive impact on the wider economy, and played down fears of rising inflation due to higher food prices. This decision, taken by the Union Cabinet headed by Prime Minister Narendra Modi came just an year before the next general election. So, more than a beneficiary measure it is being considered as a step to garner the votes of farmers. There is a significant variance between what the government considers as the cost of production and what the farmer incurs.